Wingsland S6 Drone Review 2019 – is the Wingsland S6 quadcopter worth the money? Review of features, pricing, flight duration, battery, camera and more. Wingsland, a Chinese drone company recently presented its S6 drone in Beijing, China. The new jewel comes with four folding engines and an ultra-thin design. It seems that the drone’s size is the same as an iPhone 6 Plus. 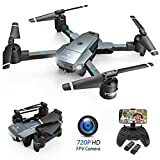 It also has a 13-megapixel camera with low distortion and 4K resolution, which allowed it to win the world’s smallest drone prize with the highest resolution. The onboard battery has a capacity of 1400 mAh and 8.7V, allowing a flight time of up to 10 minutes. Although there are drones with good autonomy (more than 20-25 flight minutes) these often cost two to three times the price of a smaller drone. The S6 can accommodate a number of accessories through a compartment located in the upper part of the body. Wingsland stated during the launch presentation that three modules will be available. Regarding the piloting of this drone, a smartphone app is available (Android and iOS). It can be controlled by a virtual joystick, gyro control and even voice commands. Among the available features include intelligent control of orientation, return to home, follow me and automatic landing. It is undoubted that a new category of drones is coming into the limelight, that is the selfie drones. The devices are designed almost exclusively to offer exceptional photographic aerial performance to best capture images than a human being equipped with a handheld camera. The small Wingsland S6 Drone can fold the arms, which support engines and propellers. You can fit the device in a pocket. However, Wingsland has not produced this little gem overnight but has completed a project over time. 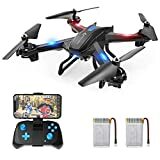 It is a small quadricopter with a customizable look in various colors. The Wingsland S6 Drone is controlled entirely via a smartphone and does not have a proprietary radio control. This is an advantage because it improves portability of the device. However, this also presents a limitation since the link between the command and the drone is handled via Wi-Fi, which can hardly go beyond 109 yards. The S6 is also equipped with GPS and in the unfortunate event that the drone veers out of the control range, it would automatically return to the starting point. The first flight for a novice user is uncomplicated since the controls are virtual. The controls are handled via a simulator, a real graphical simulation environment integrated into the app that allows you to become familiar with the piloting and with the commands that are intuitive. The device is so thin that Wingsland nicknamed it “the smartphone of the drone industry.” As if it were a valid argument for this type of product, the drone flies and it is carried in a box or a backpack. The S6 features a camera with a 13-megapixel sensor, which also allows it to shoot 4K/30 (30fps) or 1080p/60 video. The sensor transmits images to the mobile application at 720p resolution. The video recorded on the microSD card is in 4K or 1080p depending on the setting chosen by the user. The drone can fly up to a height of 109 yards and reach a speed of 17 miles per second – a satisfactory speed. The Wingsland app (available for Android and iOS) serves as a controller. It comes with virtual joysticks on either side of the screen. The levers are invisible until you press the screen with one or both of your thumbs allowing you to see what the camera is seeing. The left joystick is used to raise or rotate the quadcopter while the right is used to move forward, backward or fly sideways. The interface offers a host of options, including three control modes and some functions switch from one joystick to another. Alternatively, they allow the user to control the drone by tilting the mobile device to appeal to all types of pilots. The application even offers a simulation mode, which makes you familiar with the controls. This is a great idea from Wingsland. Although some users praise the image quality captured by the Wingsland S6 Drone’s camera, many others feel that the pictures are not satisfactory. On the other hand, everyone approves the device’s compact design, which improves portability. The S6 offers several interesting features, including taking 360-degree panoramic images. It can fly over an object or point of interest by performing a circular flight, once the subject is identified, the camera captures the scene as desired. In addition, it offers the possibility to follow the pilot, which allows the user to take selfies without worrying about controlling the drone. In addition, the S6 is equipped with two easy return systems and an alarm when the battery power level is low. 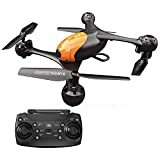 Compact, lightweight, foldable and easy to control, the Wingsland S6 drone is a quadcopter that can shoot 4K video and take 360-degree panoramic photos. It comes with strengths and weaknesses in a market filled with competitive options. Some options like the DJI Mavic Air come with modern designs and the shape of a rectangular box. This is probably the reason why, when folded, the drone resembles a small brick that leaves an impression of lightness, reminding users of a smartphone. The black propellers of the Mavic Air demonstrate the great ingenuity of DJI. With this type of propeller, the drone is much more aerodynamic. Finally, the feet of this technological jewel guarantee its stability. It is possible to take videos up to 4 km above ground. The transmission of this small machine is very fluid, ensuring total control of your shooting. Its camera has the ability to take 25 photos in just 8 seconds and create spherical panoramas with great accuracy. The Mavic Air Fly’s camera is stabilized by a three-axis nacelle. 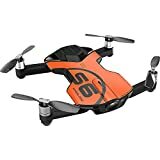 The Wingsland S6 drone is a good buy for anyone looking for an affordable, lightweight unit capable of capturing decent images.